People choose hybrids because they are environmentally friendly and have better gas mileage, but Mann Toyota knows there are other factors people consider when buying a car, such as exterior features. 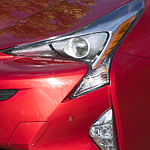 Toyota Prius is a consistently popular hybrid that combines what we buyers want and what they like. If you're looking for a car that blends in, it's not Prius. Unmistakable and bold, this hybrid announces itself every time it takes the road, and others will notice. Not only is it designed to look sleek, it is engineered so that its sleekness cheats the wind. That wind-cheating ability works just as well in Prestonsburg as it does any other place you choose to drive, thanks to a dynamic chassis and its low and wide stance. This puts the athletic appearance of your hybrid is on full display, and you get a more responsive drive.